God I used to love writing letters, I wrote to my Nanny, my little brothers, my cousins including one I never expected replies from, but he did reply and I think thats what made us that little bit closer. I had a couple of pen pals at one point too. My Bestie and I even used to keep a joint diary, which we took turns in writing in every few days, even if we fell out, so we always knew when and why we were annoyed with each other. I still like writing, hence the blog, but I’m also a writer of lists and I love posting stuff to people unexpectedly. My day is instantly better when I receive something other than a bill or some piece of junk mail in the post, and OMG if it’s handwritten….aaaaaaagh the excitement!!! Simple things…. So yes, I am promoting Thinking of You Week, ‘cos we all like to be thought of don’t we? Isn’t it a great feeling to know that somebody took time out of their busy, probably mostly technological filled day to pick up an old school pen and paper and write you a letter, or a card or even just a couple of lines on a postcard? (That was a reeally long sentence eh?) It’s also made me think of friends I haven’t spoken to in a while, not because I don’t want to, it’s just there never seems to be a spare minute in the day. It’s made me think of old friends that are always there but maybe I’ve been a bit lackadaisical with recently (I also want to apologise for that now too….I’m sorry…I love you!). It’s made me think of new friends and how happy I am to have met them (God I hope they don’t think I’m some sorta weirdo stalker now!!). Anywho, I took a little time out Friday night to sit and write a little note to some of my friends and they will hopefully receive them this week. I’m also going to get my little man involved and we’ll have a little arty day where he can paint some one off cards, so some of ye lucky buggers may even get two cards!!! Two!!! Thats two non-bills flying through your letter box. I know I can feeeeel your excitement!! 🙂 I’m also gonna do a little something on my Facebook page so pop over there and have a look too. So now I think the best thing for you to do, once you’ve read this (nosed through me other posts and told your friends they should read them too…hee hee) of course, is get writing…with pens like, and make somebody smile! 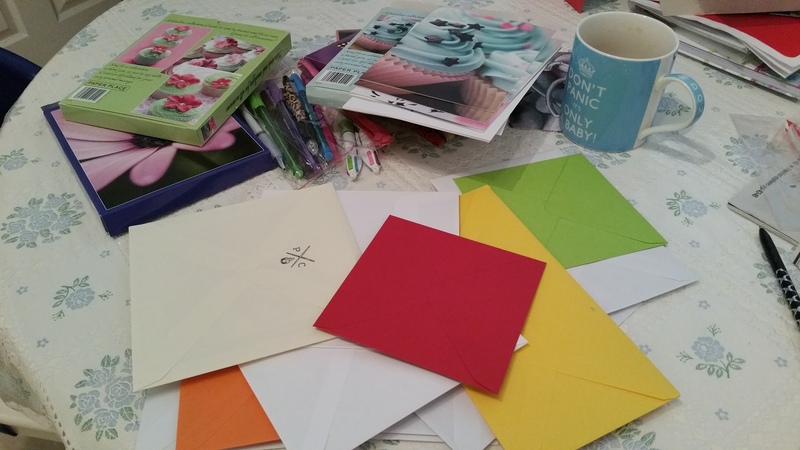 Take a look at the Thinking of You Toolkit here if you need ideas, or you could make it into a family craft day and make your own cards to send out, which is eeeven more special! When you’re done with all your real life writing you can bring the tech back in if you like… take pics and tag @GCAUK #ThinkingOfYou #SendingSmiles. Next > Eyebrows on Fleek! !